I am pleased to report that Jesus is still blonde and blue-eyed and Christian. On Broadway anyway. And this particular Jesus has had his vocal chords decked out in a coating of brass from the sound of it. This is what I did after I saw this production. I came directly home and bought the original Broadway cast album on the Internet, because I had to hear once again the music with which I had fallen in love back oh, 40 years ago. And I found it. Starting with the vocal gifts of Ben Vereen and continuing with the crystal clear Yvonne Elliman this is an iconic piece of work. But I digress. This production’s problem as I see it, is that it keeps promising to get better, and it keeps on promising up until the last moment, which is where Jesus dies, so it is more or less too late for it to live up to that promise. Although it is named for our Saviour (Paul Nolan), the story belongs to Judas (Josh Young), because he is the one who changes. Judas doesn’t like that Jesus has gone viral in the neighborhood. It is dangerous for everyone involved and Judas wishes everyone would just keep a lid on it. When Jesus, driven by his own vision of his destiny, keeps putting himself in harm’s way, Judas decides to step in with a short cut. He will do the handing over, and Jesus will be forced to repent in order to save his life. When this turns out not to be the case, Judas wants a do-over, but there is none to be had. He repents and does the only thing he can do, hang himself. Jesus is a wanderer in white who weaves himself in and out of the story. In this production he does a lot of gazing and laying on of hands. He strolls with a beatific air and occasionally loses his temper when the mortals just don’t get it. He is never more than a few feet away from Mary Magdelan (Chilina Kennedy) whose passion for Jesus seems to be her own private fantasy, because we never see what the heck is so great about this guy other than the fact that his white clothes are spotless. Ms. Kennedy’s vocal skills are no match for the men, and her songs become a detraction, which this show doesn’t need. And her costume stands out as bordering on the absurd, seconded only by Mr. Young’s blue suit. Tom Hewitt as Pontius Pilot and Bruce Dow as Herrod ( in the only number that has a pulse) bring strength and precision to this production, and for a few moments we actually see the life and death situation that is going on here. But, in the end, the parts just don’t add up, and this includes the chorography, which never jells with the action. It is another case of, in the words of my friend John Randolph, “You must never blame the actors.” Your time will be better spent wondering what the production team was thinking. "A minor and pretty mindless retelling of Jesus’ final days." "But without a strong underlying theme, the show feels like a busy patchwork of styles and references." "While ..., the performances are largely solid, this “Superstar” lacks soul." "Has a youthful ebullience, with an embrace of many styles, that still makes it a treat. ... Indelibly a show of its time, but this production suggests that it was built to last." "Has always been a challenge to mount. While this staging may be the best yet, the show doesn't always connect." "Whether the musical’s charms attract a fresh generation of converts remains to be seen, but the faithful will not be disappointed." "As a time-travel experience it offers plenty to enjoy. 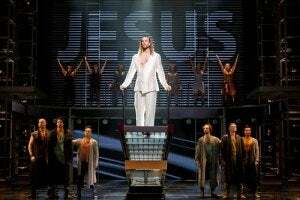 And in Broadway’s current Jesus smackdown, Superstar at least trounces Godspell."